Pilgrimage involves movement of people, either as individuals or as members of a group, in search of the sacred. Spontaneous behaviour, miraculous events, and/or ecstatic visions of individual pilgrims have often resulted in complexity in ritual, meaning, and movement. Pilgrimages may start with individual ecstatic visions, unusual strange unworldly experiences, which are the experiences of “ordinary” people, certainly not of priests or politicians. Often they are uniquely human experiences which embarrass ecclesiastical authorities. As a pilgrimage tradition evolves, sacred sites may become formalized in organized sociopolitical systems with economic overtone. Even in these structured situations, individual people may still have powerful individual experiences. Eventually a pilgrimage tradition may be taken over by religious and political authorities, lose spontaneity, and become frozen in time. But even in these situations, in which large numbers of people may gather, there is a tremendous amount of “primal” energy in which innovations and visions may be evoked. Using case studies from pilgrimages around the world, the volume explores the ways many of these traditions have started and evolved. A common perspective is that of self-organization of complex structures in space and time. 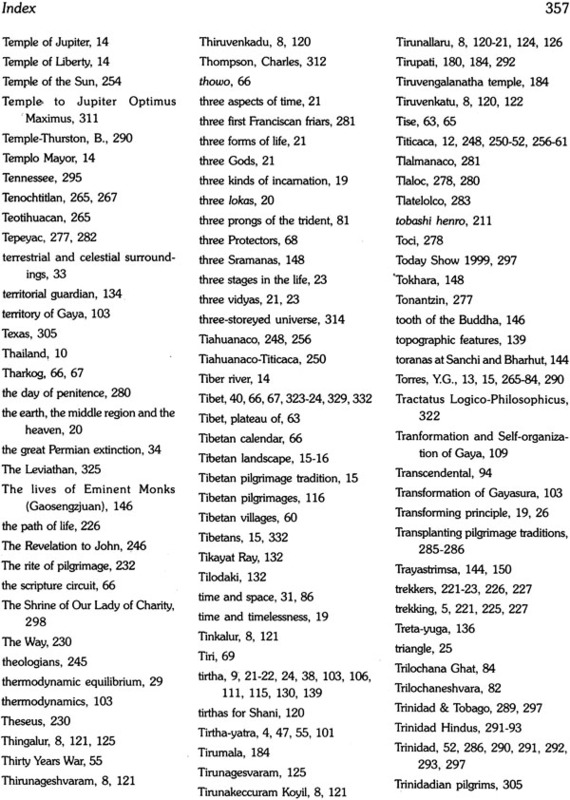 The variety of pilgrimage described in the book is remarkable. The subcontinent of India is the location of many sites such as the temples to the nine planets in Tamil Nadu, the pilgrimage circuits of Varanasi, early Buddhist pilgrimages in Sanchi and Bodh-Gaya, the great ruined city of Vijayanagara, those associated with the Ramayana, and the death ceremonies at Gaya. 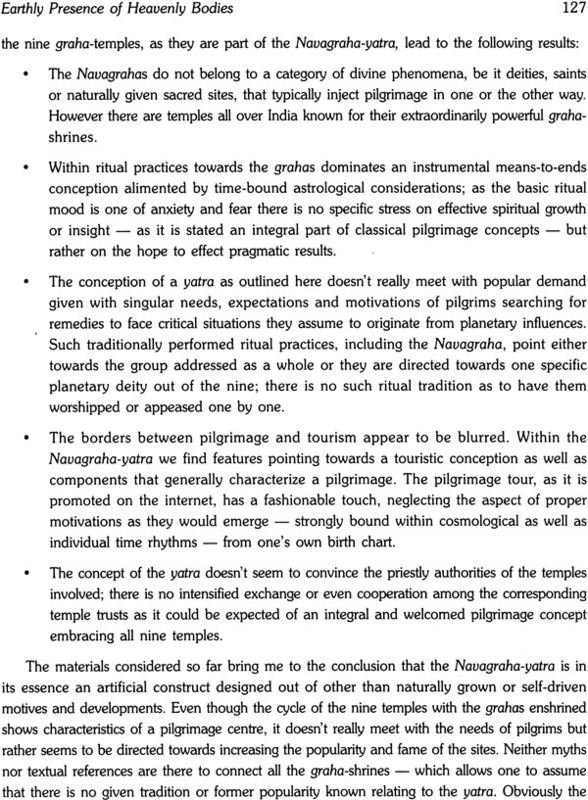 Beyond India, the self-organization and stability of pilgrimage systems are analysed for pilgrimages in Nepal (Kathmandu), Japan, Mexico, the Caribbean, Peru, Norway, and the US. J.M. Malville obtained his PhD in astrophysics from the University of Colorado. He has taught in the astronomy departments of the universities of Michigan and Colorado. At Colorado he served as the Chairman of the Department of Astro Geophysics. His research interests have ranged from the physics of the earth’s aurora and the sun’s corona, to the archaeoastronomy of India, American Southwest, Peru, and Egypt. As a visiting scientist at the Indira Gandhi National Centre for the Arts, Malville investigated the connections between astronomy, culture, and self- organized complexity. His is presently Professor Emeritus in the Department of Astrophysical and Planetary Sciences at the University of Colorado and an Adjunct Professor of Astronomy at James Cook University, Queensland, Australia. His books include A Feather for Daedalus and Prehistoric Astronomy in the Southwest. B.N. Saraswati obtained his PhD from Ranchi University and specializes in the anthropology of religion and Indian civilization. He is the former UNESCO Professor at the Indira Gandhi National Centre for the Arts. He was associated with the Anthropological Survey of India, Kolkata, for a decade, and another decade at the Indian Institute of Advanced Study, Shimla. During this period he did extensive field work in rural India and conducted a detailed study of Varanasi. Most recently he has been drawing out relevant themes from traditional thought and modern science to build up indigenous anthropology from within. He has authored The Sacred Science of Man, Ascetics of Kashi, and The Nature of Man and Culture: Alternate Paradigms in Anthropology, as well as many other books and publications. The present volume Pilgrimage: Sacred Landscapes and Self-Organized Complexity jointly edited by John McKim Malville and Baidyanath Saraswati is a collection of the proceedings of the international seminar “Pilgrimage and Complexity” held in the Indira Gandhi National Centre for the Arts, New Delhi in January 1999. The contributors are from diverse disciplines and their papers cover a wide range of ideas in this connection. Pilgrimage is a worldwide phenomenon. There is a lot of philosophical, theological and textual content in the context of pilgrimage and an attempt has been made to include all these aspects in this volume. The obligations and duties on the one hand and the penance and renunciation on the other are intimately related to pilgrimage, as the idea is of earning merit. People also expect miracles to be logically possible in such places. Places of pilgrimage are often identified by the mythical associations of their being abodes of gods, goddesses, prophets and religious preceptors or containing their body parts. The former is a mythical idea while the latter is believed to be supported by ‘material’ remains. This brings about an emotional connection in people regarding these places and gives them strength to encounter the vicissitudes of life. A few of the papers in this volume have explored the modern context of pilgrimage and vice-versa, i.e., pilgrimage in modem life. The transformation that is most noticeable lies in the provision of amenities like roads, transport, accommodation as well as encouraging tourism to develop in the places of pilgrimage which nowadays cater to not only those seeking a spiritual experience but also those who desire to travel. The divide between the sacred and the secular is gradually narrowing and getting more blurred as people are happy to mix both for a more complete experience. Pilgrimage centres are hubs of economic activities and sometimes we find temple complexes functioning like an industry due to the variety and amount of services required. Often these centres become places where alternative medicine practitioners can practise their trade. These centres are also places supporting a wide variety of networking between visitors, service providers and business enterprises. There is almost a niche-based market economy that develops in these centres. Apart from the economic activities and spiritual experiences, places of pilgrimage perform the social function of providing shelter for the poor. In the context of India, old age homes and shelters find an appropriate ambience in these places, especially in those in which pilgrimage is not seasonal or linked with some festivals and occasions. The broadening effects of travel are experienced in pilgrimage; it is a socially approved way of release from the humdrum of daily life, of heightening one’s awareness through travel, of learning about different ways of life and of stimulation of one’s aesthetic sensibilities. It may be the scenic beauty of the place, the wonder of architecture and carvings, the tranquility of the environs or it’s contrary like in some places, or even the feeling of brotherhood with other pilgrims – in short, enriching oneself. Many of these aspects have been discussed in the papers in this volume which provide quite a vicarious experience to the reader who is free to make a pilgrimage to any place in this wide world. The papers are interesting and the book in its entirety traces the many forms of tradition and their transformation. 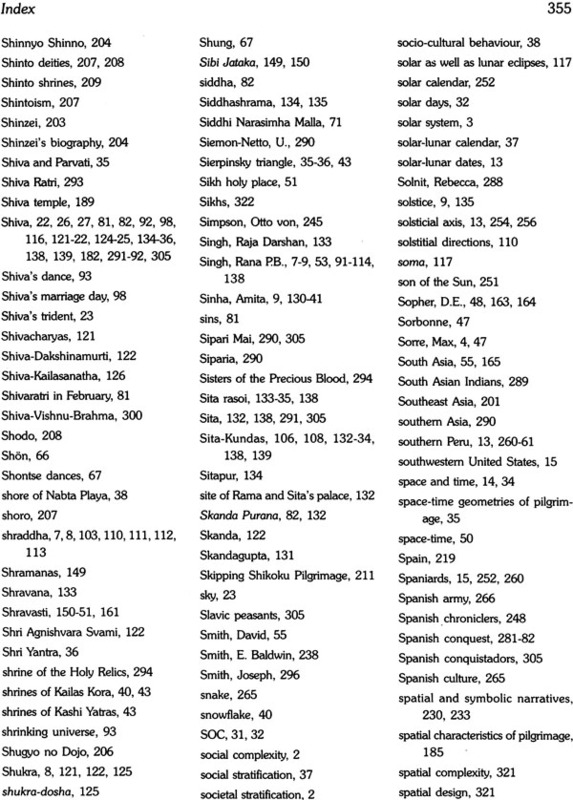 The 19 papers in this volume were presented at a five-day conference held at the Indira Gandhi National Centre for the Arts in January 1999. We are drawn to cosmos as a metaphor for pilgrimage for a number of reasons. The Greek word, kosmos, implies a universe as a harmonious system that has evolved out of chaos, which we feel is a fine metaphor for pilgrimage. In addition, many pilgrimages celebrate and re-enact the origins of the cosmos. 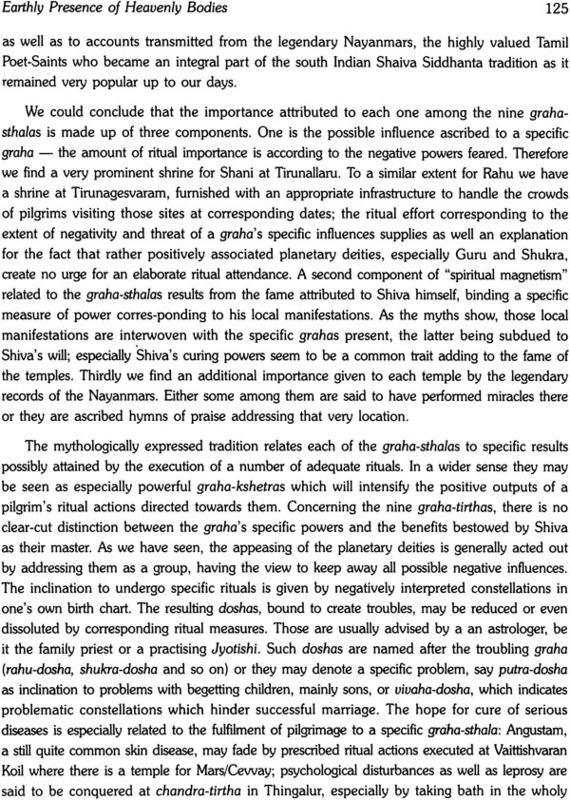 Cosmic cycles of time play a major role in the scheduling of pilgrimages and in festival calendars. Pilgrimage involves movement of people, either as individuals or as members of a group, in search of the sacred. Spontaneous behaviour, miraculous events, and/or ecstatic visions of individual pilgrims have often resulted in complexity in ritual, meaning and movement. As pilgrimage traditions mature, ecclesiastical or political authority may increasingly control them, suppressing spontaneity and innovation. But before that mature stage is reached, pilgrimage is an example of the complexity that arises from the combination of human individuality and group coherence. Pilgrims create an integrated whole that is greater than the sum of its parts. Complexity in space: By their movement, pilgrims create personal and universal maps of ritual spaces, which may involve vast amounts of territory. Cosmic geometries connect the macrocosm of the heavens with the microcosm of the pilgrimage landscape. These geometries may be cardinal or they may be influenced by local topography. Once a pilgrimage destination has been reached, circumambulation of the centre is a common experience. A spiralling path into the centre may symbolize the merging of the individual with the absolute. Complexity in time: The development of the accurate pilgrimage calendar was a major achievement of human culture. The expansion of a pilgrimage from local to regional scale awaited the invention of precise methods for measuring and structuring time. Not only were precise observations of the cycles of the sun and the moon necessary to develop an accurate calendar, but also calendrical knowledge had to be communicated across the pilgrimage “catchment” area. Few other events of humankind involve such precise voluntary behaviour of ordinary people. 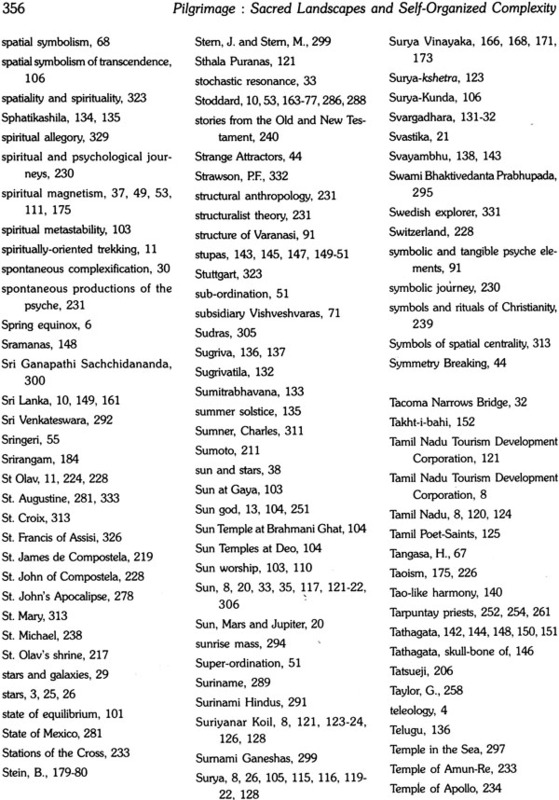 Complexity in symbol and meaning: An important aspect of pilgrimage centres is the presence of multiple interpenetrating levels of meaning and symbolism. The symbolic power of pilgrimage landscape may not only transform the individual, but also may transport the pilgrim into alternate realms that transcend time and space. Ritual complexity: Pilgrimage involves highly complex ritual traditions that embrace continuity and change, predictability and surprise, order and chaos. Does complex ritual behaviour arise spontaneously from the pilgrims or does an authority impose it? 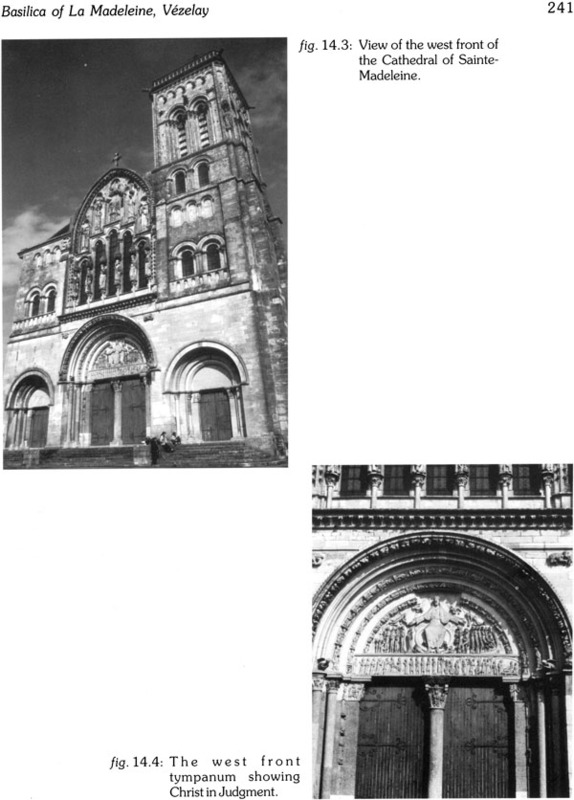 Social complexity: Pilgrimage is a major force of social integration. The pilgrimage mega community of shared ideals often achieves high degrees of complexity and stability. Societal stratification may grow out of a pilgrimage system, if leaders acquire ritual suzerainty. 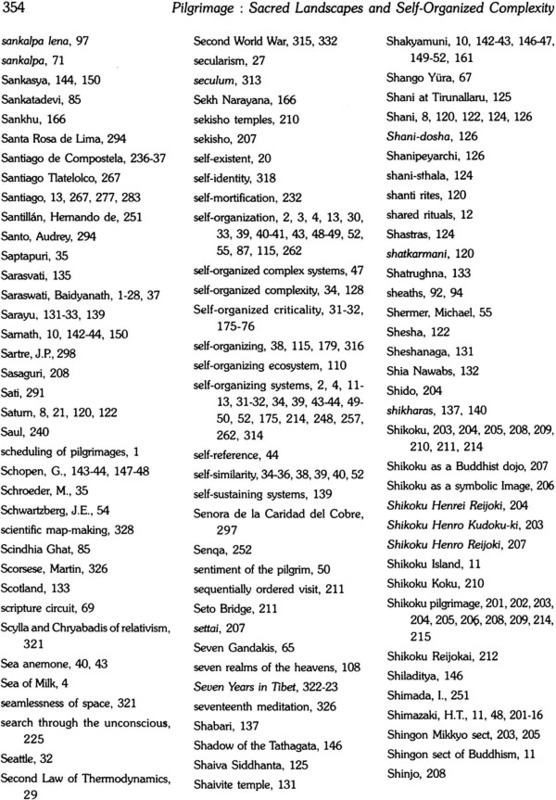 Self-organizing systems: What is the origin of the rich multilevel complexity of pilgrimage systems? Most pilgrimages are not ordained by kings or hierarchical power, but emerge as the collective behaviour of free individuals, each in search of a spiritual ideal. Similar examples of complex self-organization are found in forest and ocean ecosystems. An essential quality of pilgrimage systems specifically and of self-organizing systems in general is their openness. 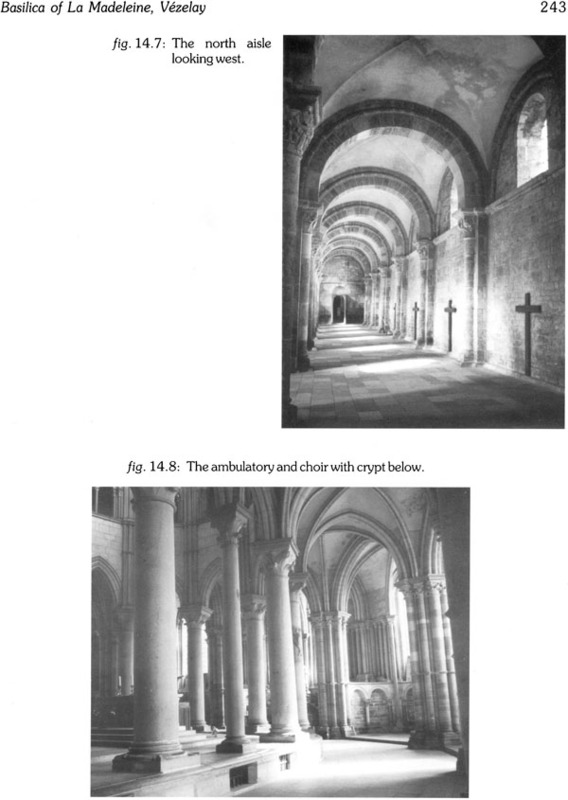 The difference between open and closed systems is especially illuminating when one compares the longevity of pilgrimage centres with the brief florescence of the closed imperial city. In closed political systems, processes are put in place that suppress innovation and accident. Visual astronomy: In addition to providing the cosmological setting for pilgrimage, astronomy plays roles in organizing time through the calendar and in visual rituals such as viewing astronomical objects, e.g., the sun at dawn. Organized by the pilgrimage calendar, vast numbers of people move across the landscape in resonance with the motions of astronomical bodies. Pilgrimage is one of the primary examples on our planet of a dynamic parallelism of macrocosm and the human microcosm. The self-organization of the universe has proceeded through time. 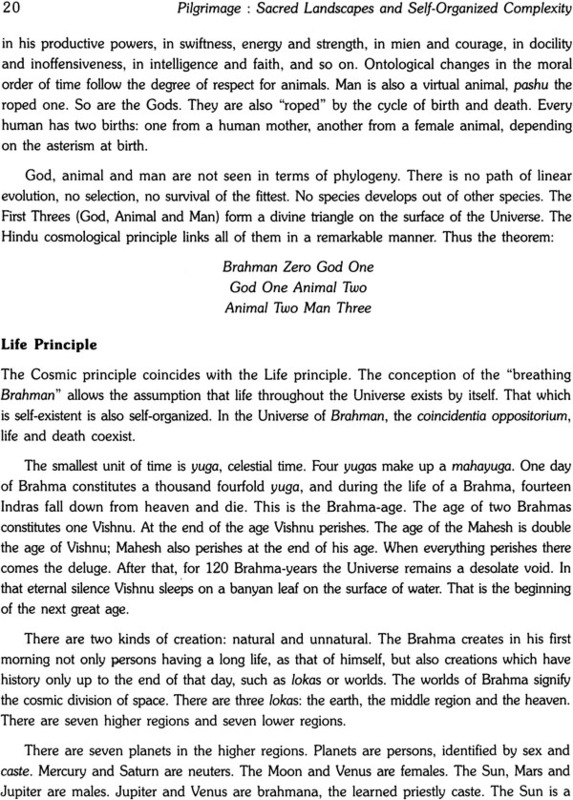 In the Hindu cosmos the flow of time is described in term of yugas, mahayugas, and immense Brahma-years. These periods of time are as vast as anything we know of in astrophysics, in which our present universe started approximately 15 billion years ago. These cycles of time may be embedded in even greater expanses of time, which are shared with multiple universes that appear out of and dissolve back into a boundless ocean of superspace and supertime. Pilgrimage intertwines theory and landscape; both are necessary. 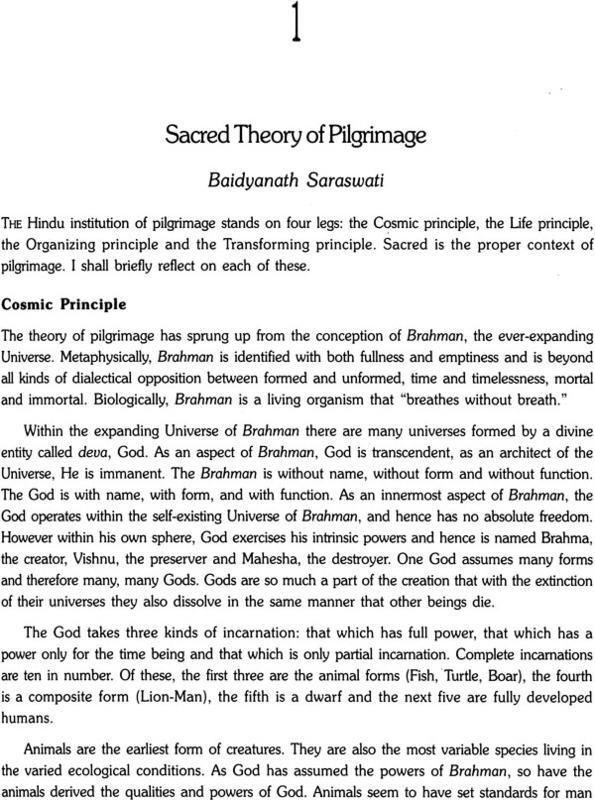 Saraswati uses Kashi as a concrete example of the theory. 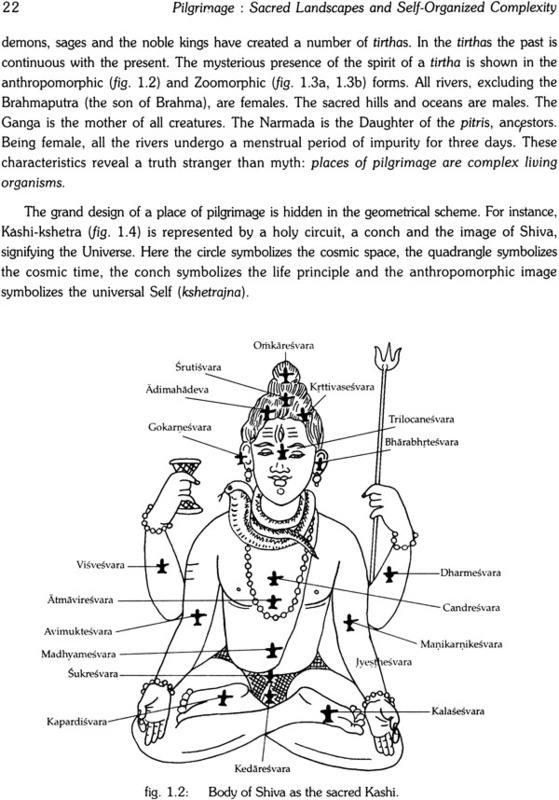 The inner complexity of the (infinite) cosmic Kashi is made simpler and comprehensible in the (finite) earthly Kashi. Self-similarity and scale invariance could not be clearer: exact size is irrelevant. The shrine of Madhyameshvara, the Lord of the centre, is the centre of both the infinite and finite Kashi. The pilgrims move along the 3 concentric circles: the inner sanctum formed by 3 sectors represents the microcosm; pilgrimage in the radius of 5 kosa signifies the mesocosm, and the larger circle in the radius of 84 kosa stands for the macrocosm of Brahman where all the 33 crore of Gods and Goddesses reside. Pilgrimage follows a cycle of time, which contains elements that are similar to the large cosmic cycles of birth and death. The paths of clockwise circumambulation may not form a perfect circle or triangle or quadrangle, but the pilgrims’ movement amplifies all the possible forms of cosmic geometries resulting in a complete picture of the Universe. Because of the principle of self-similarity, pilgrims visiting Kashi get the feeling that they moved into the boundless cosmic space in all its directions, all its constellations, planets, stars, and Gods through the 6 seasons, driven in the solar car. 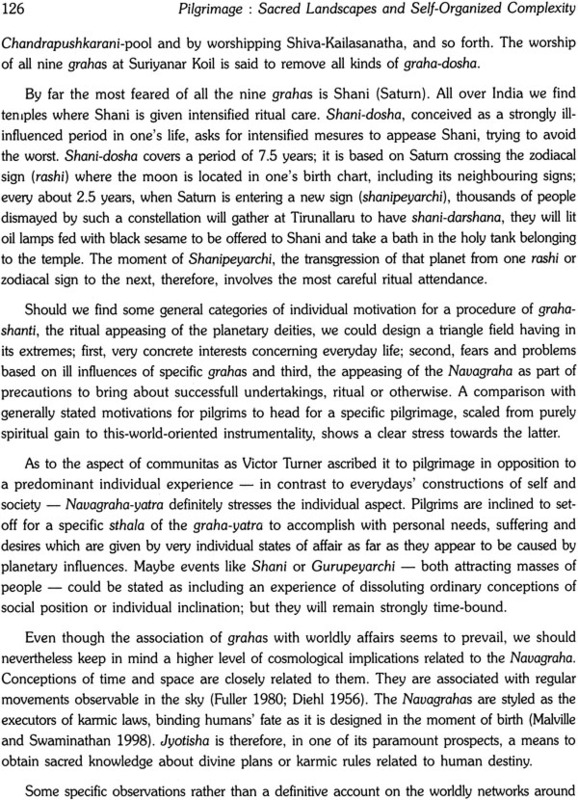 The earthly Kashi is a paradigmatic model that includes within itself the patterns of all other places of pilgrimage. All the sacred spaces, all the Gods and Goddesses, all the sacred rivers and mountains, and all the planets and stars are manifest in Kashi. The clockwise circumambulation of Kashi-kshetra may be conceived as an imitation of the great solar system. The movement of the pilgrims around a fixed centre, e.g., temple, stupa, free, or deity, is like the movement of the Sun, Moon, and planets and hence is archetypical. What follows is the great principle of Life. Everything is moving. 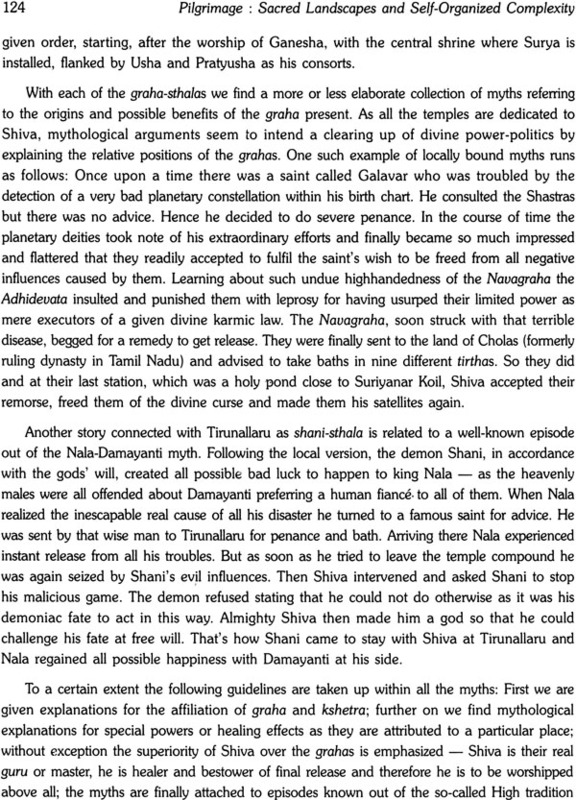 Even Dhruva (pole-star) is only relatively fixed, as, in fact, it also moves in the heavens. 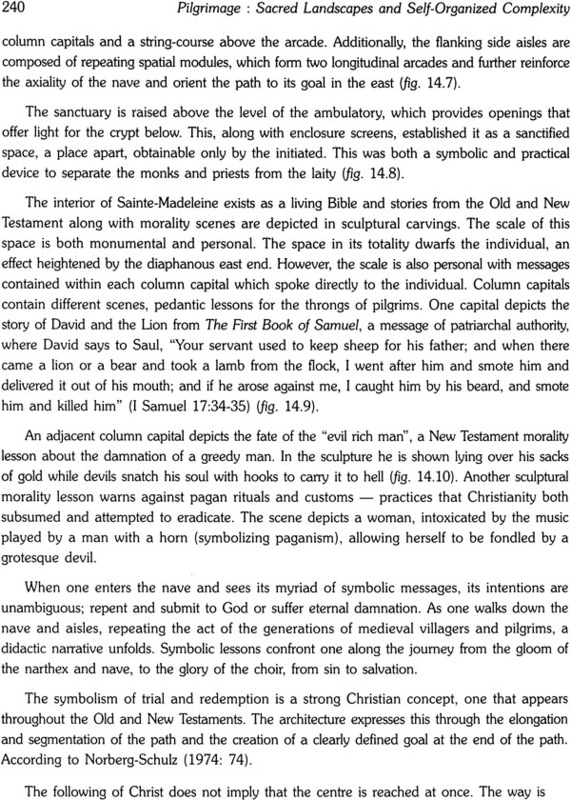 Numerical symbolism provides an abstract and profound link between the pilgrim and the invisible forces of God. The use of numerical concepts helps one to visualize the unity of places and peoples, objects and ideas, visibles and invisibles. Malville introduces the idea of self-organization by contrasting the two types of stable systems that can be found in the physical universe: the death state of perfect equilibrium and the infinitely fertile condition of self-organization. The latter provides useful models for many complex features of the natural world, which are characterized by fractal geometries, cooperative behaviour, self-similarity of structures and power law distributions. He proposes that pilgrimage systems may be viewed as natural and self-organizing structures wherein complexity develops through the spontaneous and coherent behaviour of free people. Examples of such systems in the natural world range from earthquakes, schools of fish, forest fires and rain forests. Openness to the outside environment and coherent behaviour are necessary conditions for self-organization and the growth of complexity. Forces that disrupt equilibrium may drive cultural systems and individuals into a state of metastability or self-organized criticality lying between frozen inactivity of equilibrium and disordered hyperactivity. As systems depart more from equilibrium the amplification of small fluctuations by non-linear processes may result in stress-releasing avalanche-like movement of people to pilgrimage centres. The resulting cultural systems may be highly non-adaptive as judged by prior paradigms. Self-organization lacks an overall goal or teleology because the future is an unfinished project. At each stage, along the trajectory of cosmic time, emergence of new purpose provides new meaning. Because of a common conceptual framework that threads the system, a self-organizing system is characterized by self-similarity and scale invariance: similar patterns are repeated with different sizes or time scales without changing their essential meaning. The body, temple and universe are perceived as self-similar and fundamentally identical in many traditions. The pilgrim may follow a pathway that represents the universe from centre to periphery or that mimics the evolution of the universe from birth to death. In field studies at Mt. Kailasa and Varanasi Malville is able to show that circumambulation pathways have the characteristics of self-organization. Bhardwaj combines the Hindu pilgrimage traditions of linear tirtha yatra and circular pradakshina-parikrama as interlinked concepts. He notes that the geographers, Vidal and Sore, identify circulation of people as a transformative process that can upset traditional cultural equilibria and encourages the growth of new lifestyles and paradigms. The stirring of the cosmic ocean by the devas and asuras is a fine example of such circulation which destabilizes but also creates something absolutely new and life affirming, amrita. Churning disrupted the calm of the Sea of Milk; swirls in the ocean have smaller and smaller self-similar eddies. There is another metaphor of circulation and holism in the form of the serpent as he encircles the mountain and is pulled back and forth by the devas and asuras, whose differences are momentarily dissolved. Circulation of blood in the human body is a means of connecting the local to the whole and achieving coherence of the system. Another well-known example is that of Gaia, through which the whole biosphere has been unified and transformed into something entirely new through the circulation of oxygen and carbon dioxide. Bhardwaj observes that circulation not only diffused traditional ideas but also changed traditions. As a somewhat ironic consequence, tradition and change are converted from opposing entities to complementary components of a self-organizing system. There is a “push-pull” quality to a pilgrimage centre. The centre has to have its power of place, but in order to be influenced and personally transformed by the pilgrimage process, there has to be a personal sentimental attachment to the place. “Aimless wandering” does not lead to pilgrimage; nor does trekking through an alien, albeit dramatic landscape such as adventure tourism. The individual and his/her goals change through the process. The pilgrimage landscape is not like the wheel with its still-point in the fixed geometric centre and the repetitive revolutions of the rim, the image of perfection in the Greek world of movement without change. Pilgrimage is, instead, like a growing, changing living system. As in the living system, circulation purifies and energizes both the moving agent and the system; both pilgrim and landscape are mutually transformed. The procession re-awakens, rejuvenates, re-energizes the land and city, as an internal cycle is necessary to maintain and energize a stable system. The circulation of people is often in resonance with the great cycles of the cosmos. That circulation brings the human microcosm and the macrocosm into synchronism. Part of the springtime celebration involves returning to and union with the place of origin. A continuous cycle pilgrimage is consistent with the essential circulatory pattern of the world, which has no beginning and end. There is non-verbal communication between landscape, pattern of the movement, and individual pilgrim. One of the consequences of the processional circulation is social and symbolic integration of the individual into the system to achieve unity and holism. These open systems in which there are great flows of people and ideas are subject to change. By contrast the equilibrium system has negative feedback loops, which suppress change. The non-equilibrium system has non-linear processes, which amplify small changes. The strange attractor has a complementary quality, as an endless journey and a goal. There is a centre toward which energy flows: it can only be approached but never fully reached. This is a classic existentialist dilemma of seeking the centre as if it were reachable, but knowing all along that it can never be reached. 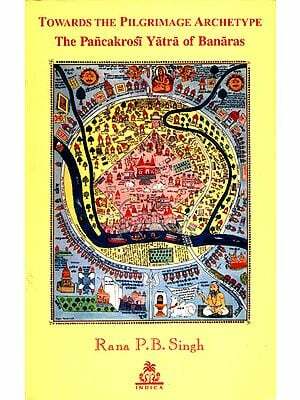 Gutschow continues the discussion of circulation and pradakshina in his in-depth study of pilgrimages at Bhaktapur, Muktinath and Varanasi. 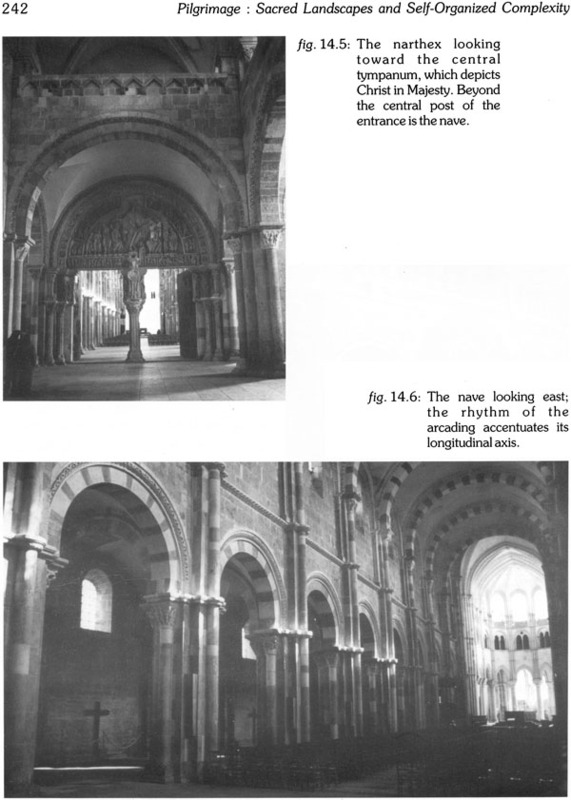 He notes that circumambulations identify “inner” and “outer” spaces. In quoting Panikkar, “there is no outer without inner space,” which referred to human being, Gutschow acknowledges the condition of self-similarity, in which the size of the territory is irrelevant. Beyond the “inside” exists an “outer” space, which, on a different level, might be the “inside” of another entity with a different size. And so it goes, upward or downward, meaning and form are repeated. The case of Varanasi reveals such circumambulatory routes, which enclose each other in order to incorporate an ever-increasing space. The case of Muktinath provides a different model. There, the six villages of the valley are circumambulated individually, while only on rare occasions are all six villages circumambulated in order to reconfirm a political entity. In the case of Bhaktapur all representations of “place” are worshipped on the occasion of New Year along a circular route that encloses the city. A self-organized system must reject and eject those anti-entropic processes that lead to disintegration and loss of complexity. Bhaktapur is protected from those demonic forces by eight shrines to Ashtamatrika, which form a complex mandala that surrounds the sacred realm. Spring equinox is a “cosmo-drama,” celebrating renewal of the world on Mesha Samkranti. The celebration involves killing the serpent, which is associated with the darkness and water of the period between fall and spring equinoxes when the sun is below the cosmic ocean. The erected pole symbolizes the axis mundi, which pillars apart the world while uniting and stabilizing the world. The procession re-awakens, rejuvenates, re-energizes the world. The circulation of people is in resonance and parallelism with the great cycles of the cosmos. The continuous cycle of the procession is consistent with the essential circulatory flow of energy that stabilizes the system, which has no beginning and end. There is non-verbal communication between the landscape, the pattern of the movement of people through the landscape, and individual pilgrim. One of the consequences of the processional circulation is social and symbolic integration of the individual into the system and every part thereof to achieve unity and holism. Ritual circumambulation of the cultivated area of Muktinath is a festival of renewal that confirms and energizes the protective deities. The protecting Grandfather and Grandmother are located at the north and south poles of the land, which are themselves self-similar to the north-south axis of the cosmos. On the procession there are halting places at four cardinal roads, which are blocked by piles of stones to protect the interior from the threat of chaos and dissolution from the outside. The outside is necessary as a place into which disorder and low grade energy can be exported. Without the outside, the interior world would dissolve into the meaninglessness of pure equilibrium. Thus, we can invert Panikkar’s dictum: there can be no inside without an outside. The Caurasikrosi-yatra of Varanasi is a perfect circle with Madhyameshvara at its centre. It is an “ideal” figure, which is not walked today, and perhaps in reality when it was walked, it was not “perfect.” The Panchakrosi-yatra is an approximate oval but quite irregular, more natural, and apparently self-organized, as suggested by Malville’s measurements.